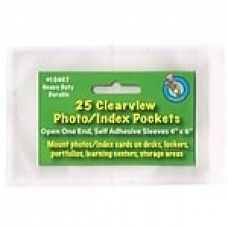 Self-adhesive photo/index card pocket protect student's name at their desk. Ashley Clear Self-adhesive photo/index card pocket is perfect to hold small/large name plates, incentive charts and documents etc. Heavy duty card stock pocket is plastic sleeve that protect student's names at their desk and sold as 25 per pack.